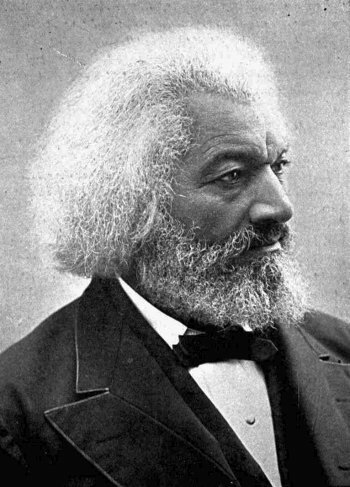 „Those who profess to favor freedom, and yet depreciate agitation, are men who want crops without plowing up the ground” – this is just one sentence by Frederick Douglass, amazing American activist and writer, leader of the abolitionist movement, whose spirit accompanies me recently. „Frederick Douglass wrote in that first narrative of his life how his second owner, Mrs. Sophia Auld, when he was twelve, began to teach him letters, and to read a few simple words. But she was vehemently discouraged by her husband Hugh, who told her, when he came to understand what she was doing, that “You cannot teach slaves to read for it, will make them uneasy in their slavery, unmanageable and sad.” Frederick Douglass said “I now understood what had been to me a most perplexing difficulty—to wit, the white man’s power to enslave the black man.” Thus he began to learn more to read, and when Ms. Auld, having accepted her husband’s direction in the matter, found him reading a newspaper, she tore it away from him lest he become unfit for slavery. Thus he was required, as he tells us, to learn to read in secret. When hired out to Mr. William Freeland, he taught other slaves to read, until such time as the surrounding slave owners became aware of what he was doing, at which point the mob invaded his Sunday schooling place and beat the people and destroyed the school. Reading was the pathway, Fredrick Douglass wrote, from slavery to freedom”. This anecdote shows why literacy is so important for sub-dominated and why it is dangerous for those who are determinate to sustain the power. People who can read are able to understand the unjust of their own position. And they start to dream. „Once you’ve visited other worlds, like those who ate fairy fruit, you can never be entirely content with the world that you grew up in. Discontent is a good thing: discontented people can modify and improve their worlds, leave them better, leave them different.” – this is how Neil Gaiman explain it in his interview for Guardian. „There were noises made briefly, a few years ago, about the idea that we were living in a post-literate world, in which the ability to make sense out of written words was somehow redundant, but those days are gone: words are more important than they ever were: we navigate the world with words, and as the world slips onto the web, we need to follow, to communicate and to comprehend what we are reading. People who cannot understand each other cannot exchange ideas, cannot communicate” – argued Gaiman. The exchange and communication is necessary to gather enough data and to interpret them (interpretation is a creative process and as so it requires collective input), to build a knowledge. We can observe that as literacy of the world’s population increase, the significance of the words – their potential to change the reality – becomes larger and larger. The words create a narration that can explain more and more complex world in a way that cuts straight to the hearts. Without words, and the information they carry, we will be just slaves, or puppets if lucky, in the hands of 147 companies that control 40% of corporations. But before a child becomes a scientist, an activist, a businessperson or a parent, should fall in love with literature, even those of the average sorts. It is important because it also develop so called emotional intelligence. Reading helps to learn how to identify, to express and finally to communicate one’s emotions, needs and reflections, in a manner understandable to other people. It was all possible before the invention of writing, but writing allows faster and more effectively communication with people outside the circle of friends/family. And „knowledge plus empathy” sounds like a potential recipe for injustice. So Hugh was right, reading makes people uneasy with their slavery and unmanageable, but I think he was also wrong – it doesn’t make us „sad” but rather angry. And when we will meet a critical mass, anger turns into rebellion. – Invisible chain that starts with letter „f”?